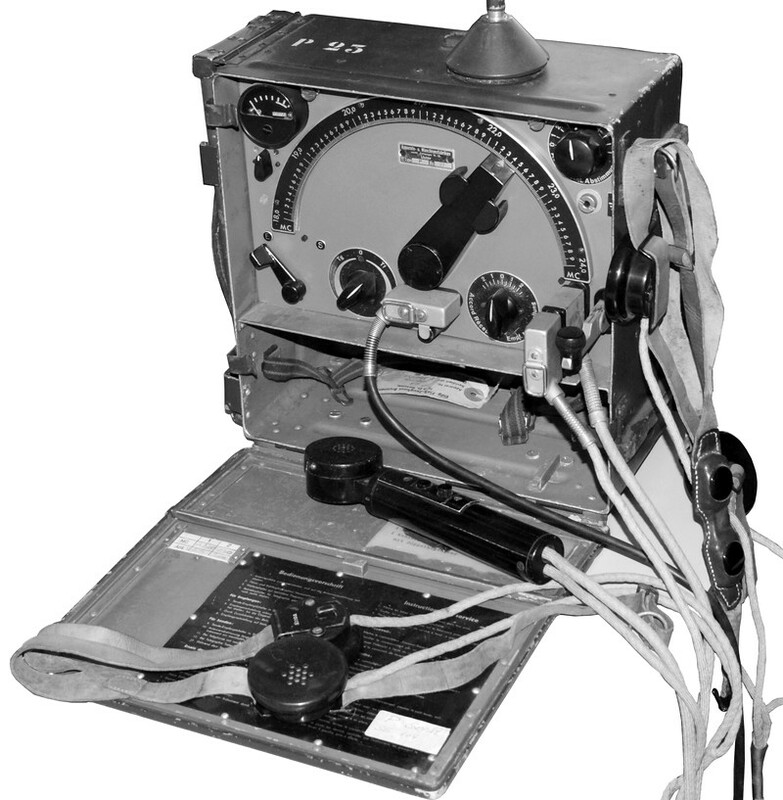 The P set constructed by Zellweger, Uster, has been introduced as standard set for the infantry radio-equipped patrols; a similar set with higher transmitter power is the P5 set. The P set (Infantry Patrol set) consists of a transceiver case with a battery compartment (weight 12 kg), a generator case (another 12 kg) with the hand cranked generator and spares and a canvas bag with material for a long distance antenna. The receiver can be powered from a combined LT (1,5V)/ HT (126V) battery or a hand cranked generator; for transmitting, the hand cranked generator must be used under all circumstances, a relay prevents the transmitter section to be be powered from the battery which might be exhausted very soon. The set switches automatically from receive to transmit mode when You press the push-to-talk button or when You operate the integrated morse key, one second after transmitting the last morse code letter, the SE-104 returns to receive operation. The huge frequency dial pointer also acts as tuning knob, it does directly operate the main tuning capacitor of the transmitter and receiver sections. Press the two pushbuttons at both sides of the dial pointer to move it, it will lock in 20 kHz steps mechanically. A round thumbwheel lets You detune the set for +/- 50 kHz, to move the dial pointer to another position, set the interpolation tuning knob to zero again. A rotary control "Empfangsnachstellung" permits to shift the receiver's operation frequency +/- 50 - 100 kHz. The accessories can be stored in a compartment just below the transceiver chassis: the combined LT / HT battery, the headphones, the hand mike and the throat microphone; the receive / transmit switch as well as the morse key are integrated in the front panel. The generator is integrated in a case very similar to the transceiver case: a voltmeter indicates, when the necessary voltages for operation are okay or if You have to crank with higher speed to generate the heaters / LT voltage of 5,7 V ond the anode / HT voltage of 120 Volts. When the generator cable is plugged into the socket on the transceiver, it's batteries are switched off. The hand cranked generator is the same as the one used with the K 1 A set. The set's operation range is 0,5 km in telephony and 2 km in telegraphy mode in a housing area and up to 12 or 15 km from a optimum location on top of a hill.